On March 24, 2016 The Netherlands and the whole world has lost a legend, a creative genius, my childhood hero Johan Cruyff, legendary Dutch football player, nr. 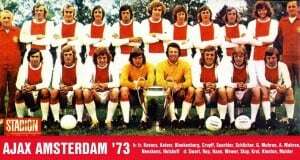 14 who played for Ajax, Barcelona, New York Cosmos and LA Aztecs. Not only was Cruyff an incomparable football (soccer) player but he was human being helping kids around the world, notably in poor areas with his Cruyff Foundation and his Cruyff Courts. I decided to write the first blog on the revamped and redesigned 40parklane.com web-site in honor of this incredible man. There are so many reasons I want to highlight this extraordinary person, and there are so many great stories to tell about Johan Cruyff but to do so I would need many more pages and much more time. Plus, I would have to go up into the attic to try to find my treasure box with my Ajax pajama and my scrap book with endless news-paper and magazine clippings of the days Cruyff was a football (soccer) star in Holland (Ajax and the Dutch National team) and Barcelona (FC Barcelona). 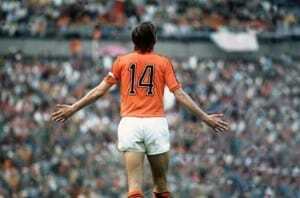 Cruyff was the epitome of creativity, vision and leadership. Many people including myself have benefited greatly from his incomparable football, his vision and his quotes. 40ParkLane which is derived from Parklaan 40 in The Netherlands, where Hans van Putten grew up, was the basis for our vision, our creativity and our ethical and humanitarian heritage. We will strive to be an organization with vision for Web Design, Digital Marketing and Business Administration and hope to help those who need it the most. I’m not religious. In Spain all 22 players make the sign of the cross before they enter the pitch. If it works all matches must therefore end in a draw. When you play a match, it is statistically proven that players actually have the ball 3 minutes on average … So, the most important thing is: what do you do during those 87 minutes when you do not have the ball. That is what determines whether you’re a good player or not. Every professional golfer has a separate coach for his drives, for approaches, for putting. In football we have one coach for 15 players. This is absurd. I find it terrible when talents are rejected based on computer stats. Based on the criteria at Ajax now I would have been rejected. When I was 15, I couldn’t kick a ball 15 meters with my left and maybe 20 with my right. My qualities technique and vision, are not detectable by a computer. Surviving the first round is never my aim. Ideally, I’d be in one group with Brazil, Argentina and Germany. Then I’d have lost two rivals after the first round. That’s how I think. Idealistic. Players today can only shoot with their laces. I could shoot with the inside, laces, and outside of both feet. In other words, I was six times better than today’s players. There are very few players who know what to do when they’re not marked. So sometimes you tell a player: that attacker is very good, but don’t mark him. The above quotes show his vision and intelligence and many of them apply to modern day life and business as well. Johan, thank you for the joy, the fun and wisdom you have given us for so many years. RIP.